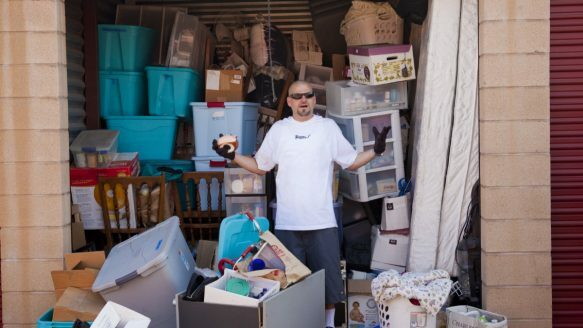 Why is “Storage Wars” one of the most popular shows on television? A&E’s megahit has turned the relatively obscure practice of bidding on expired storage units into the most popular game show on television. Each episode builds up the anticipation of not only finding out the contents of each unit, but then learning just how much each unit is worth (though my biggest problem with the show is the values are often dubious in their interpretation). Secretly everyone watching considers becoming a storage unit bidder. You think to yourself, “Is it really that easy? Spend a hundred bucks on a storage unit and turn a couple thousand dollars profit? I thought about “Storage Wars” quite a bit as I prepared for our church’s yard sale this past weekend. At one point I even met a church member at her storage unit to pick up some items. She had not been to the unit in years. When she unlocked the door the mountainous contents were overwhelming. Inside just this one storage unit were bags on top of boxes on top of bags of…well…junk. Sure, we sold many of her items, but most of the bags and boxes were junk. Old pillows and blankets and picture frames and half broken furniture and chipped up trinkets. Why would anybody hang on to any of this? Why would anyone think they need to make a monthly payment to store up garbage? It’s not uncommon for the average American to own a storage unit. You may have one or two yourself. Do you realize how incredible this is? Not so long ago only a member of royalty would even think of purchasing an extra unit of space to keep all the stuff they wanted but didn’t have room for. That’s what our homes are supposed to be – places to keep our stuff. When did we get to the point where we thought we needed to keep the things we no longer used? Our stuff has sharp, deep claws on our souls. We can’t bear the thought of throwing anything away. There’s another all too popular reality show called “Hoarders” focused on people so addicted to stuff, they literally collect garbage. I’m not immune to this addiction. I spent 7 weeks trying to detox from possessions as part of a bible study called The 7 Experiment. Each week the study challenged us to let go of one area of spending – clothes, possessions, food, etc. Those 7 weeks rocked me. There often seems to be a hollowness to the days where I do not spend money. I buy things to feed a constant hunger for more stuff. Life seems like a game where acquiring the most stuff is the only way to win. After all, when you think of a loser what do you think of? Someone with old clothes, an out of date car, and a cheap Motorola flip phone. Winners have things – lots of new, exciting and flashy things. Winning in life is all about getting more. Yet the practice of acquiring more stuff never fills me up. It only leaves me hungry for more. I try to fight against this lie of the world, but I struggle. As soon as I try to give things away my mind starts playing tricks. There’s a reason and an excuse for everything in my collection. The enemy wants me to believe I need more stuff. I’m sure there are many legitimate reasons to own a storage unit and many well-intentioned individuals who own them. But I think we’d be happier in a world without “Storage Wars”. If you’re struggling with spending, I strongly recommend you pick up a copy of Jen Hatmaker’s book 7: An Experimental Mutiny Against Excess, or get a small group together around The 7 Experiment bible study. What’s in your storage unit? What are the possessions you can’t seem to let go of?